The Oath Keepers want to give America its own Freikorps! Summary: The Right wing of America is active on all fronts: shutting down abortion, disenfranchising voters, and holding America’s credit rating hostage. Now we add to that list something small, but disturbing and with the potential to grow explosively: the Oath Keepers, one of the many militia-like groups, are “going operational”. This is a follow-up to About the Oath Keepers: boon or bane for the Republic? Who are the Oath Keepers? This cannot be good news: “Oath Keepers to Form ‘Civilization Preservation’ Teams in Anticipation of Societal Collapse“, Ryan Lenz, Southern Poverty Law Center (SPLC), 2 October 2013. Think of this as COIN brought home, as blowback from our wars. It is an old story, but one that seldom ends well: methods that we use on foreigners return with the veterans, who then lead in applying them at home. If this catches on, it probably will not end well for America. Future historians will see this as a logical evolution following the militarization of the police, alienation of conservatives from American society, and the transformation of law enforcement agencies into security services. to assist in forming and training town and county militias (established by official act of town and county elected representatives). We want our chapters to organize themselves as a working model that we can then take to other veterans organizations, such as the VFW, American Legion, Marine Corps League, etc. in each town and help them establish such teams within their already existing veterans halls. And likewise, to serve as a model and training cadre to help churches, neighborhood watches, and any other civic organization organize. We are basing this on the Special Forces model, which has a twelve man “A team” of specially trained soldiers who are inserted into a community to train and lead that community in resistance to oppressive regimes (hence their motto: “De Oppresso Liber“). SF’s primary mission is to teach, organize, and lead, rather than to directly fight. They can fight, of course, but they are most dangerous as a force-multiplier by helping an entire community to fight. We will do the same – be force multipliers to help prepare communities so they can preserve civilization by providing their own security, disaster relief, infrastructure preservation, emergency communications, strategic food reserve, and medical care. Oath Keepers is using that successful model and adapting it to our mission, to form Oath Keepers “Civilization Preservation Teams” (we have already received critical input from some of our Special Forces members, and are actively seeking more input from others within the Special Forces community). … Like SF, all Oath Keepers will be expected to learn light infantry skills. They will all be encouraged to attend an Appleseed Rifle Program and shoot to “Rifleman” standards. Just as the Marines say that every Marine is a Rifleman (even the cooks) so will every Oath Keeper be a rifleman. After learning solid rifle marksmanship, they will learn individual movement and tactics, then buddy team, fire-team, and squad movement and tactics (shoot, move, communicate). All of you infantry veterans need to step up and teach these skills to everyone else. So, it is not just the Scouts who will learn those skills – everyone on a field team will learn them, and even the support team members should at least train in the basics so they can defend themselves. The US government is spending billions of dollars on ammunition, armored vehicles, and weapons for DHS and local police. It is spending nothing on food for the people. They are preparing to control and contain us, and to shoot us, but not preparing to feed us. Why is that? You know the answer. ADDITIONAL ANALYSIS: To the above, we now add Brandon Smith’s insight that with a war in Syria, the elites can trigger an economic collapse with a war – with Russia and China using economics as a weapon in retaliation. All China would have to do is dump US treasuries and refuse to trade with US dollars. That would begin the final death-spiral of the dollar. It is because of the systemic weakness of the American people, and our strategic checkmate position of having no strategic food storage and no effective local security, that we feel the need to take Oath Keepers operational and put our focus on each chapter being a training cadre to get their communities as prepared and organized as possible in whatever time we have left. We urge you to presume the worst in the short term, and to work in three or four month sprints – assume that a collapse will be triggered this fall/winter and do all you can to get yourselves and your communities ready. If it doesn’t happen in the next four months, then do another sprint, of three or four more months of preparation. And keep going until it happens – which it will eventually, no matter what anyone does. The dollar is doomed. Some of this is accurate and reasonable. Some of this is wrong. Some of this is mad, extreme even for the right-wing extremists (e.g., birthers, gold bugs, believers in ObamaCare death panels, and Obama’s apology tour). This kind of thinking results from the closed circle of the right-wing information cycle. Slowly these people’s world view has disconnected from reality, and all the sources that could keep them tethered are dismissed as false (of the enemy). Slowly they’ve drifted into madness. Liberals laugh. They might not laugh for long. This could spread fast and wide under some circumstances, such as a downturn in the economy or another large terrorist attack. We do not need Nostradamus to see how this could go bad, despite their good intentions. 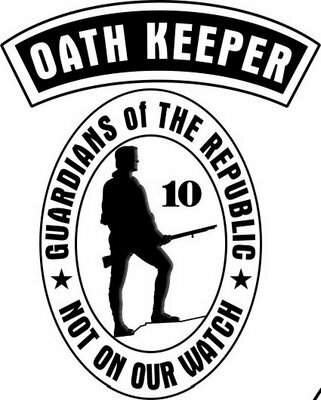 (2) Who are the Oath Keepers? Read the complete description here. Most were nationalistic and radically conservative and were employed unofficially but effectively to put down left-wing revolts and uprisings … Their members were involved in several political assassinations, of which the most dramatic was the 1922 murder of Walther Rathenau, the country’s foreign minister. At first sanctioned, or even supported, by such figures as Defense Minister Gustav Noske and General Paul von Hindenburg, the Freikorps finally came to be viewed as a nuisance and a threat, and their activities were eventually supplanted by regular army and police work or assumed by the new units of the Nazis and other political parties. Ernst Röhm, a Freikorps commander, later became head of the Nazi SA, or Brownshirts. The Homeland Security assessment report “Rightwing Extremism: Current Economic and Political Climate Fueling Resurgence in Radicalization and Recruitment“, 7 April 2009. Does not specifically mention the Oath Keepers. Sheriff Richard Mack (RET) Responds to Southern Poverty Law Center Smear Attack on Oath Keepers and him, posted the Oath Keepers website, 19 August 2009 — Ignores all the concerns the SPLC raises. “Antigovernment extremists are on the rise — and on the march“, Newsweek, 8 April 2010 — Their typical thin gruel. Interview with Stewart Rhodes, Raw Story, 4 May 2010 — Weird format for an interview. More like an editorial-interview. See part 2 here. Articles by the Southern Poverty Law Center. Given the history of American para-military organizations oppressing Blacks, their concern is understandable. “The Second Wave – Return of the Militias“, August 2009 — Throughly researched; discusses the O.K. on page 7. How can I get your friends from homeland security to leave me alone? I kind of like it as an alternate reality. As long as they dress in 17th century militia garb, and use muzzle loading black powder muskets, and keep a vigilant watch for redcoats and unionists, I don’t see a problem. While they dress themselves, both in rhetoric and sometimes clothing, in forms of long-ago — the Right’s methods are state-of-the-art. IMO, this is why — broadly speaking — they are winning. The Left reassures themselves by mockery. It’s the equivalent of a poker game where the bon vivant Ivy League life-of-the-party goes home wearing nothing but his underwear. While the not-quite-fashionably dressed Iowa Tech guy who owns 3 car dealerships walks home with all the cash. The real Left has been dead, incapable of affecting much of anything since about the time McGovern lost to Nixon. These days, ‘the left’ has been co-opted by Feinstein and Obama type characters. So, you can vote ‘left’ and still get support for all the wars, the massive network of overseas bases, the domestic spying and drone killings. You might be correct; these things are difficult to see. An alternative explanation is that the Left remains, but the center has moved away (an explanation of why — or how — the Right is winning): The world of wonders: Democratic Party takes center, pushes GOP right to madness, 19 February 2013. Evidence: “The conservative shift in public opinion has happened in all 50 states“, Peter Enns (Asst Prof of Government, Cornell; bio here), blog of the Washington Post, 9 October 2013. The mainstream isn’t going to the right, it has gone to militarism and it’s going to totalitarianism. You can be a mainstream politician these days and believe that any Arab adult male killed by a drone is a presumed combatant. You can be mainstream and think the bombing of Libya was a success — and ignore the chaos that’s there now. 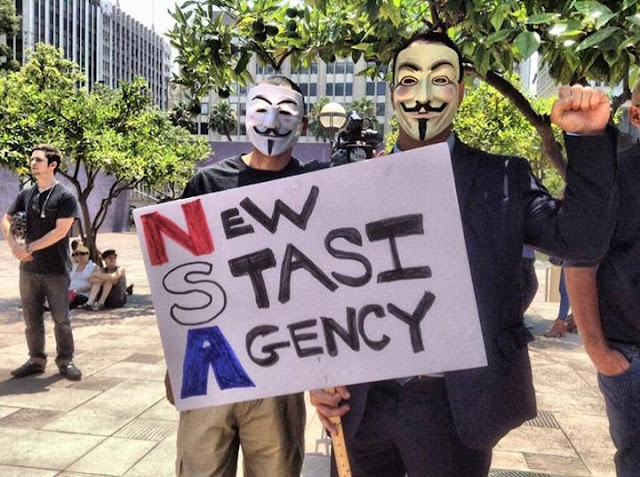 You can believe that the NSA recording of every phone call in the country is legal and still be mainstream. And, yet, the thing we really have to be concerned about is some fringe right wing group? I say don’t worry. The NSA has all their phone records. They know everyone every member has ever talked to. They know everything they ever bought. All it takes is one ‘Night the Long Knives’ and all these guys will no longer be a problem. The state has all the power here. You are, of course, correct. But that is not the threat of the Oath Keepers. They are pro forma an anti-government organization. But are they — their training, their accumulated arms — a realistic threat to the government? Probably not, for the exact reason you mention. They do not appear to have adequate internal security, and so are probably known (certainly so for their leaders) to the security agencies. The likely result would be similar to that of the 1956 coupe attempt in Hungary. The CIA had spent vast sums on agents and arms to prepare a secret army for the revolution. When it happend during two weeks in October 1956 the Soviet’s and the Hungarian allies arrested the secret army with little difficulty. This post mentions the Freikorps as a more disturbing model: vets and police organized to work with powerful elements of the ruling elites. They did not fighting the government, they fought as part of an internal conflict within the ruling elites. Since their opponents were not so well organized, this gave their side a decisive advantage. Having support inside the army and police can — along with powerful political support — lessen the effectiveness of a crackdown on the insurgents. The analogy in US history is the KKK. They existed not in opposition to the South’s government, but as a para-military unoffical part of it. They could have easily been crushed, but their political backers and members in the police provided protection. Think of the Freikorps, KKK, and perhaps US militia as an army directed not at the government, but at us. We are the vulnerable element. Nah, not that difficult to see if you look at it from the radical left’s point of view. Legend has it that back in the 1970’s, by a rare (but not unique) confluence of factors, progressive forces swayed the federal government to forcefully exercise its power for the greater good. That being civil rights for women and minorities, and social justice for to (un-)tip the scales in favor of the poor. Other more obscure legends tell that these things came, in part, as a result of actual episodes of violence and chaos, by unruly citizens who somehow managed to organize. The reactionaries back then were also organized and also violent, but strangely, when the radical leftists and radical reactionaries physically fought, and drew attention to what was going on, public opinion was sympathetic to the cause of the leftists, and when the violence was put down, and the underlying issues worked their way through our political system, something useful actually happened. Or so the legend goes. It seems that now, compared to the radical right, there just isn’t a mass movement for re-organizing society along leftist principles, except among pacifists. And they alone can’t be effective, pacifists only work when they’re the alternative to something more scary, like a “good cop”. There really needs to be a “bad cop” for that to work. Like MLK and Malcom X if you like an example that’s perhaps too intense. The effective “good cop” / “bad cop” game today is the Republicans and Democrats. Both playing for the same team. I suppose the same thing could be said of the fringe right groups — they’re someone’s “bad cop”. I don’t know that world well, so these articles are really enlightening. Nicely said; that is a cogent analysis. I totally agree, and have written about this at length. The two major parties represent different factions of our ruling elites, hence their agreement on key aspects of national policy — economic and defense, especially. We will see this at work when Obama gets an opportunity to support a grand bargain on the Simpson-Bowls gutting of the New Deal safety net. The votes were counted and one wing of our one ruling party won. Rejoice! Yes, they are effective shock troops for the GOP. Born in opposition to bank bailouts, now they support the bank-friendly GOP — making themselves a despised minority in order to drag the Overton Window to the Right. I agree. Civil rights for Blacks was an economic blow to the plutocracy (much like the New Deal protections for unions, now being unraveled). Civil rights for women and gays an irrelvancy. I prefer Joel Kotkin’s thesis that this is a manifestation of a geographic schism opening between our urban centers and the rural/suburban counties. As the status quo deteriorates, resources are drawn into the urban power centers by our elites. Most of the pain has so far lbeen successfully shifted outside our urban cores. The anger and desperation you note is a geographic phenomenon. Thanks for pointing to Joel Kotkin’s work (see his website). People talk about the strong political differences between regions, but these these differences magnified by our winner-take all system: small differences between party success by State creates the illusion of massive differences in outcome. For a more accurate view see these Maps of the 2012 US presidential election results. They provide powerful evidence of Kotkin’s theory. Basing an article (in large part, anyway) upon information provided by the reactionary left-wing nutjobs at SPLC hurts the credibility of even some of the rational points in the piece. Their bias against right-leaning organizations isn’t even debatable among intelligent, fair minded people. Again -the article makes a few valid points sprinkled in among the overreaction, but most folks know where the SPLC is coming from. Wow. Now that’s a fact-filled, logical rebuttal. We stand defeated by your reasoning ability. The many specifics mentioned by the SPLC and the others cited have been waved away. In what sense can the SPLC be considered “reactionary”? A person or a set of views opposing political or social liberalization or reform. Synonyms: right-wing, conservative, rightist, ultraconservative. This is not correct. The work of the SPLC is cited (but not quoted), along with work from 9 other sources (including Homeland Security, American Conservative, Police magazine, and Newsweek). But the only source quoted is the Oath Keepers website. Their own words provide all the information necessary to evaluation them, imo. Cited, quoted, whatever… Touched a nerve, did we? Conclusion: no, your accusation did not “touch a nerve”. It was just an incorrect analysis, easily disproven. A post is “based on” the information given (e.g., quotes). The citations, mostly listed in the “For More Information” section, are pointers for people who want to read more. They go to articles showing both sides. Despite the inference of your pretentious, condescending tone (X4! ), I am fully aware of the meaning of the words. This doesn’t change the fact that most of the fair-minded folks I know get that the SPLC is not a credible (or objective) source. That’s it. That was my primary point, although if one accepts that premise, then (by logical extension) the use of SPLC in any manner to buttress your case, hurts your case. I certainly never claimed to be presenting a “fact-filled, logical rebuttal.” I could make a very compelling case regarding the left-wing reactionary nutjob nature of SPLC’s body of work, but my dance card is pretty full these days. How’s this, though, in the interest of saving time: Lighten up, Francis! The SPLC is, in fact, a group of left-wing reactionary nutjobs. Weak start. Most of us outgrow such name calling in high school. I have said this twice. Perhaps thrice is a charm. I listed them as one of a wide range of sources, pro and con, about the OK. The SPLC was not the basis of the post. The words on OK website was. Also, citing people”you know” as evidence is not, IMO, compelling evidence. And the pro-OA sources sited were, by your logic, also there to “buttress my case”. I do not follow your logic. Yes, we all know. My comment was sarcasm, as shown by the “/sarcasm” tag at the end. The point of which was that facts and logic are useful for others; your name-calling is chaff. With the effort you put into these comments you probably could have given actual reasons, instead of name-calling. Repeating your childish insults does make them more convincing. Well I guess I’m to the left of those guys, but would describe myself as conservative. What is interesting about them is there elevation of the Military ethic to the level of a social good. Its very Prussian. Also, despite there fear and worry about governmental tyranny, they are, for the most part government workers. That ties in with recent polls highlighted by Fabius on this site that trust in nearly all institutions apart from the Military and the Police is declining. Certainly the Military itself functions as a parallel state, with its own police, intelligence, social and medical care. The future maybe less totalitarian, and more star ship troopers. That’s an interesting historical analogy, one I’ve long wanted to write about. Are becoming like Prussia? High degree of income inequality. The military is by far our most respected institution, and given a high fraction of resources relative to that in other nations. Our foreign policy driven by use of military for largely imperial goals. Like all such analogies, it is suggestive rather than exact. But disturbing. Agreed. An it is a socialist State, but its leaders are passionately anti-socialist. They are pro-capitalism, anti-government, often even Libertarian — ruling a system in total opposition to their value structure. Perhaps the resulting cognitive dissonance: lost every war since Korea (which was a tie), astonishing bind-bendingly high failure rate in their capital projects (their space program spent almost as much as Apollo during the same period, but accomplished almost nothing), etc. I enjoyed reading Heinlein’s novels. But the social systems in his works are as realistic as J. M. Barrie’s (the Peter Pan books). 1) The social status of a soldier or NCO in the Old Prussisan Army was very low, this improved after 1806 (a little bit) and much more after 1870. The New Prussian Army after 1806 drafted between 20 and 50% of the men of a yeargroup. 2) The families of the Prussian military nobility were ususally poor. There was almost no other accepted occupation for the noble men which provides money save the military, clear contrast to today’s situation. 3) The pay of officers was on an international scale quite low. The lowest rank, which offered some kind of economic security, was Captain (Hauptmann, Rittmeister) in combination with an company CO position. 4) The pay of enlisted men and NCOs was very low, too. The latter were to a certain extend compensated with health care for their families and low-pay jobs in administration or state railways companies after discharge in the second half of the 19th century. 5) There was not any kind of provision for the families of dead soldiers, therefore, officers without additional private income were often not allowed to marry, most of these issues were not solved until 1920. 6) The regiment COs had a very clear picture of the requirements of the “product” officer, they decided until WW II who became officer and who not, education was only one feature, but not the most important. Even long spans of peace time -like 1815-1864 or more important 1871-1914- did not really damage the quality of the officers, not sure any longer about the modern German army. 7) The intellectual freedom of a Prussian officer was much higher than the one of his US peer. Some of these aspects are discussed in Jörg Muth’s “Command Culture”. Copying the facade without understanding the underlying features is IMHO not useful. Thanks for the info about the Prussian Army vs ours. Not at all what I expected. Any thoughts on similarities between Prussian society and the evolution of US society? They are, of course, very different. When do you expect elections to be cancelled? Next year, 2050, etc? It makes a difference. Can you provide any evidence to support your prediction? What level of confidence do you assign to your prediction? Or, in other words, what odds do you give for “no elections on or before (date)”? I’m buying stock in tin foil and i predict huge market spikes every three to four months. this way, when i leave the poker game in my underwear, i’ll have cash at home to buy new clothes. Thanks for raising this quote. Why would the O.A. leaders make such an easily falsifiable short-term forecast? My guess — emphasis on guess — is because they are not serious, nor do they expect their words too be taken seriously. This is street theater. Internet cosplay. It’s a Renaissance Festival for conservatives, as are many Tea Part events. There are no consequences for saying silly things while performing. What would these people do if they really believe that there were high odds that this forecast was correct? Something far different than they’re doing today. well, it’s kinda like the folks who believe the rapture is coming, no? they have faith in the event itself (otherwise, why bother? they’re not a front for a party like some tea party scare group) if not faith in their ability to predict it accurately. they just ‘know’ it’s coming and ‘know’ they’ll be ready when it does. Possible. But I doubt that our rulers are as excited by the Left’s and Right’s street theater as our news media, whose amnesia (and need for copy to fill the space between adverts) makes every sunrise a surprise. Let’s not exaggerate. The State functions important to America’s stakeholders still function. Govt checks are mailed,the military runs at almost full speed, etc. Furloughed employees get what will probably be in effect extra paid vacation time. It is a slowdown, not a shutdown. Your thoughts: This kind of thinking results from the closed circle of the right-wing information cycle. Slowly these people’s world view has disconnected from reality, and all the sources that could keep them tethered are dismissed as false (of the enemy). Slowly they’ve drifted into madness. Really? What is reality? Is reality believing that the federal government has bypassed basic constitutional rights to privacy, speech, due process without any repercussion to Americans’ freedoms? Is reality believing that the country will continue to maintain its standard of living despite the fact that the federal government continues to borrow nearly 1 trillion dollars a year to fund such standard of living, and that the only reason the country can do this is because the Federal Reserve must buy up most of the u.s. debt issuance to tamp down on interest rates so that borrowing costs don’t spiral out of control? I don’t think you have a very good handle on what “reality” is for this country. Nor do I think you are adequately prepared for what happens to a country accustomed to have an exorbitant privilege based on nothing more than the international community having “full faith and credit” of the u.s. (which is eroding rather quickly). I do not know what you are referring to, as you don’t refer to anything in this post. Plus of course their belief in an attempt soon to “overthrow the Constitution”. If you agree with the views of the OK leadership, there is nothing more to say. They said to expect these things in 4 to 8 months. Check back in 4 months to tell us if anything described in their announcement has happened. If not, check back every 4 months until you change your thinking. fabius, i referenced your quote in my opening–regarding how they have become “disconnected with reality”. my point, is, well have they? who are the ones disconnected with reality? at least they SEE the issues and the potential problems this country faces. problems that the government and mainstream media do not cover. perhaps they understand that once a loss of faith in the fed and in the country’s ability to repay its debts comes to fruition–and you are fool to think it wont happen–the country is in for VERY hard times. Yes, timing is always the downfall for anybody who throws out specific time lines for predicted events, and yes lack of timing can turn prognosticators into broken clocks right twice a day, but instead of timing, you should be focused on the substance of their beliefs. You are absolutely wrong (and shame on you for outright propaganda) to state that Oath Keepers are a de facto anti government group. That is ridiculous. It is an organization comprised of men and women in service to their country. They are a group that is opposed to a government that overrides checks and balances put in place by the constitution to prevent the abuses that are taking place now. And seeing how our federal government’s popularity and credibility is at an all time low, I would say they are on to something. Bottom line is you are impugning the groups reputation, and your timing issue is a strawman argument. Yes. But you did not say which part of the OathKeeper’s statement you believed I incorrectly described. Do you believe that our elites are plotting to destroy America? Do you expect that our rulers (or an faction of them) to suspend the Constitution in the next four months? They made highly specific claims. Be specific, tell us what you think of some of their specific claims. As for the rest of your comment, I believe their words are sufficient supporting evidence for my summary. In fact, your rebuttal in effect says that they are nice people, so they cannot mean what they say. I don’t see that as a compelling analysis. This is over analytical garbage designed to sidetrack the people from the real issue.The situation is simple, our rights are being stripped, our vets and public servants are being labeled terrorists by a government intent on absolute control. And Americans are are finally deciding to be American. Pick it apart , throw your theological fodder in, oooh lets have more fake discussions and waste time while we watch our sovereignty get trampled. What a waste of bandwidth. What a fine example of the “one problem” myopia! Do you recommend ignoring repairs to all vital infrastructure during the long (perhaps mulch-generational) process of political reform? No attention to monetary policy. No attention to flood control, sewage treatment, wildfires, etc? 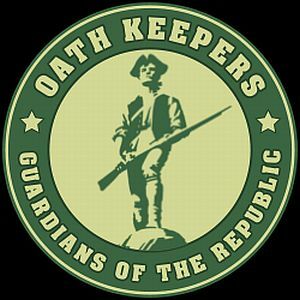 OathKeepers.org is an Unlawful Radical Militant Group. I admit Oathkeepers.org has a high motivation in patriotism and a sincere desire to defend the Constitution. However they discriminate and do not allow all citizens to join equally within their radical militant group, or without paying membership fees to do so. Oathkeepers.org primarily recruits and only allows people with former and current government authority to join with full membership, and everyone else are considered associate members. To be in compliance with the Constitution, militias must be essentially local and independent of established authorities, since they may have to challenge or bypass those authorities if they abuse their authority or fail to perform their lawful duties. Furthermore, groups not open to full public membership and/or which are organized for any other purposes are not militias in accordance to the Constitution of the United States. Groups not open to public membership and/or which are organized for any other purposes are not militias. Therefore Oathkeepers.org and their members do not fully comply with the Constitution and are an unlawful radical militant group. The true nature and purpose of a citizen militia is defensive and concerns itself with the preservation of Life, Liberty and the pursuit of Happiness. As such, a real Militia is regarded as serious and ever vigilant, but they are not militant. However there are individuals or groups such as ‘OathKeepers.org’ that are determined to be engaged in combat and are aggressively active. These individuals or groups are not militias they are militant. We must remember our founding fathers insisted on a distinction between the “genuine” Militia and a “select” militia, which they viewed as a danger, just as much a danger as a standing army. They did not want a militia whose members might consist of anything less than the entire people, or at least able-bodied ones in a certain age range, because if selected on any other basis, they might be used to oppress other parts of the population. In this case our founding fathers would clearly consider Oathkeepers to be a “select” militia when 100% of the group with full membership are former military and police, not to count a few civilians who never served and are considered associate members. To say it more simply, Oathkeepers would be a legally sanctioned “genuine” militia in accordance with the Constitution if they fully complied with the Constitution. Instead they are an unlawful radical militant group outside of the Constitution, and what our founding fathers would clearly call a “select” militia. Read more about what is a real constitutional Militia at: http://www.militianews.com. To what articles of the a Constitution are you referring? I don’t recall anything in the Constitution corresponding to most of your assertions.